As reported by Bloomberg, Tesla has acquired the innovative energy storage company Maxwell Technologies for $218 Million. The move is a direct departure from Tesla’s current energy storage requirements; instead of relying on lithium battery technology, this acquisition could signal a change to capacitor technology. The key selling point of capacitors, either of the super- or ultra- variety, is the much shorter charge and discharge rates. Where a supercapacitor can be used to weld metal by simply shorting the terminals (don’t do that, by the way), battery technology hasn’t yet caught up. You can only charge batteries at a specific rate, and you can only discharge them at a specific rate. The acquisition of an ultracapacitor manufacturer opens the possibility of these powerhouses finding their way into electric vehicles. While there is a single problem with super- and ultra-capacitors — the sheer volume and the fact that a module of ultracaps will hold much less energy than a module of batteries of the same size — the best guess is that Tesla won’t be replacing all their batteries with caps in the short-term. Analysts think that future Teslas may feature a ‘co-battery’ of sorts, allowing for fast charging and discharging through a series of ultracapacitors, with the main energy storage in the car still being the lithium battery modules. This will be especially useful for regenerative braking, as slowing down a three thousand pound vehicle produces a lot of energy, and Tesla’s current battery technology can’t soak all of it up. [Nikola Tesla] believed he could wirelessly supply power to the world, but his calculations were off. We can, in fact, supply power wirelessly and we are getting better but far from the dreams of the historical inventor. The mainstream version is the Qi chargers which are what phones use to charge when you lay them on a base. Magnetic coupling is what allows the power to move through the air. The transmitter and receiver are two halves of an air-core transformer, so the distance between the coils exponentially reduces efficiency and don’t even think of putting two phones on a single base. Well, you could but it would not do any good. [Chris Mi] at San Diego State University is working with colleagues to introduce receivers which feature a pass-through architecture so a whole stack of devices can be powered from a single base. Efficiency across ten loads is recorded at 83.9% which is phenomenal considering the distance between each load is 6 cm. Traditional air-gap transformers are not designed for 6 cm, much less 60 cm. The trick is to include another transmitter coil alongside the receiving coil. By doing this, the coils are never more than 6 cm apart, even when the farthest unit is a long ways from the first supply. Another advantage to this configuration is that tuned groups continue to work even when a load changes in the system. For this reason, putting ten chargeables on a single system is a big deal because they don’t need to be retuned when one finishes charging. We would love to see more of this convenient charging and hope that it catches on. If you ever doubt the potential for catastrophe that mucking about with electric vehicles can present, check out the video below. It shows what can happen to a couple of Tesla battery modules when due regard to safety precautions isn’t paid. The video comes to us by way of [Rich], a gearhead with a thing for Teslas. He clearly knows his way around the EV world, having rebuilt a flood-soaked Tesla, and aspires to open an EV repair shop. The disaster stems from a novelty vehicle he and friend [Lee] bought as a side project. The car was apparently once a Disney prop car, used in parades with the “Mr. Toad’s Wild Ride” theme. It was powered by six 6-volt golf cart batteries, which let it maintain a stately, safe pace on a crowded parade route. [Rich] et al would have none of that, and decided to plop a pair of 444-cell Tesla modules into it. The reduced weight and increased voltage made it a real neck-snapper, but the team unwisely left any semblance of battery management out of the build. You can guess what happened next, or spin up to the 3:00 mark in the video to watch the security camera mayhem. It’s not clear what started the fire, but the modules started cooking off batteries like roman candles. Quick action got it pushed outside to await the fire department, but the car was a total loss long before they showed up. Luckily no other cars in the garage were damaged, nor were there any injuries – not that the car didn’t try to take someone out, including putting a flaming round into [Lee]’s chest and one into the firetruck’s windshield. [Rich] clearly knew he was literally playing with fire, and paid the price. The lesson here is to respect the power of these beefy batteries, even when you’re just fooling around. When referring to classic cars, there’s a good reason that “they don’t make ’em like that anymore.” Old cars represented the limits of what could be done in terms of materials and manufacturing methods coupled with the styles of the time and cheap fuel. The result was big, heavy cars that would cost a fortune in gas to keep on the road today. Some people just don’t want to let those styles go, however, and send their beast off for some special modifications. This 1949 Mercury coupe with an electric drivetrain conversion is one way of keeping that retro look alive. Granted, the body of the car is not exactly showroom quality anymore, from the light patina of rust on its heavy steel body panels to the pimples cropping up under its abundant chrome. But that’s all part of the charm; this comes from conversion company Icon’s “Derelict” line, which takes old vehicles and guts them while leaving the outside largely untouched. This Mercury was given a fully electric, 298 kW drivetrain. The engine bay and trunk, together roomier than some Silicon Valley studio apartments, provided ample room for the 85 kWh Tesla battery pack and the dual electric motors, with room left over to craft enclosures for the battery controllers that look like a V8 engine. Custom electronic gauges and controls that look like originals adorn the chrome-bedazzled dash. The beast tops out at 120 mph (193 km/h) and has a 200 mile (322 km) range before it has to find a Tesla supercharger. Or a lemonade stand. Say what you want about the old cars, but they had plenty of style. We appreciate the work that went into this conversion, which no doubt cost more than all the gas this thing has ever guzzled. Thanks to [Qes] for the tip. In one bad week in March, two people were indirectly killed by automated driving systems. A Tesla vehicle drove into a barrier, killing its driver, and an Uber vehicle hit and killed a pedestrian crossing the street. The National Transportation Safety Board’s preliminary reports on both accidents came out recently, and these bring us as close as we’re going to get to a definitive view of what actually happened. What can we learn from these two crashes? There is one outstanding factor that makes these two crashes look different on the surface: Tesla’s algorithm misidentified a lane split and actively accelerated into the barrier, while the Uber system eventually correctly identified the cyclist crossing the street and probably had time to stop, but it was disabled. You might say that if the Tesla driver died from trusting the system too much, the Uber fatality arose from trusting the system too little. But you’d be wrong. The forward-facing radar in the Tesla should have prevented the accident by seeing the barrier and slamming on the brakes, but the Tesla algorithm places more weight on the cameras than the radar. Why? For exactly the same reason that the Uber emergency-braking system was turned off: there are “too many” false positives and the result is that far too often the cars brake needlessly under normal driving circumstances. The crux of the self-driving at the moment is precisely figuring out when to slam on the brakes and when not. Brake too often, and the passengers are annoyed or the car gets rear-ended. Brake too infrequently, and the consequences can be worse. Indeed, this is the central problem of autonomous vehicle safety, and neither Tesla nor Uber have it figured out yet. The Tesla Model 3 has been available for almost a year now, and hackers and tinkerers all over the world are eager to dig into Elon’s latest ride to see what makes it tick. But while it’s considerably cheaper than the Model S that came before it, the $35,000+ USD price tag on the new Tesla is still a bit too high to buy one just to take it apart. So for budget conscious grease monkeys, the only thing to do is wait until somebody with more money than you crashes one and then buy the wreckage cheaply. Which is exactly what electric vehicle connoisseur [Jack Rickard] did. He bought the first wrecked Model 3 he could get his hands on, and proceeded to do a lengthy teardown on what’s arguably the heart and soul of the machine: its 75 kWh battery pack. Along the way he made some interesting discoveries, and gained some insight on to how Tesla has been able to drop the cost of the Model 3 so low compared to their previous vehicles. On a Tesla, the battery pack is a large flat panel which takes up effectively the entire underside of the vehicle. To remove it, [Jack] and his assistant raise the wreck of the Model 3 up on a standard lift and then drop the battery down with a small lift table. Here the first differences are observed: while the Model S battery was made for rapid swapping (a feature apparently rarely utilized in practice), the battery in the Model 3 battery is obviously intended to be a permanent piece of the car; removing it required taking out a good portion of the interior. With the battery out of the car and opened up, the biggest change for the Model 3 becomes apparent. The battery pack actually contains the charger, DC-DC converter, and battery management system in one integrated unit. 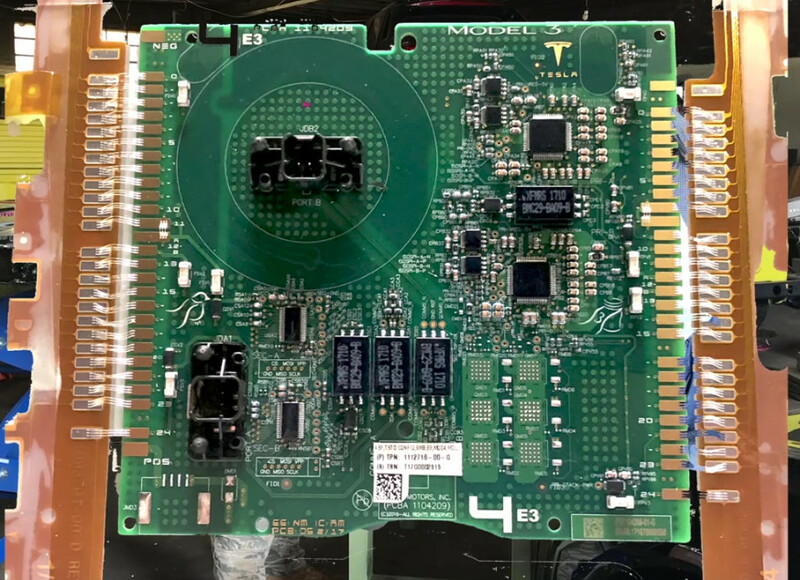 Whereas on the Model S these components were installed in the vehicle itself, on the Model 3, most of the primary electronics are stored in this single module. That greatly reduces the wiring and complexity of the car, and [Jack] mentions the only significant hardware left inside the Model 3 (beyond the motors) would be the user interface computer in the dashboard. When the communication protocol for this electronics module is reverse engineered, it may end up being exceptionally useful for not only electric vehicle conversions but things like off-grid energy storage. A little over a year ago we featured a similar teardown for the battery back in the Tesla Model S, as well as the incredible project that built a working car from multiple wrecks. In two weeks the Hackaday Community is gathering in Belgrade for Europe’s greatest hardware con, The Hackaday Belgrade Conference — an event not to be missed — but of course the city itself is a spectacular place to visit and has the perfect feel for those who like to build electronics. Why not join us for your own geek world tour to Serbia? Here’s a few of the things you’ll want to see while in Belgrade. Belgrade is a tech center and a hidden jewel of Europe. Need proof? Fly into Belgrade, and you’ll land at Nikola Tesla Airport. Pick up a car at the airport and you’ll pass a great glass torus housing Serbia’s Museum of Aviation. Here, you’ll find aircraft from both sides of the cold war, Sabres and MiGs, Hurricanes and Messerschmitts, a quite rare Sud Caravelle, and the canopy of the only stealth bomber ever to be shot down. It’s an aviation geek’s paradise, and you haven’t even left the airport. What else is in store for you when you visit Belgrade? For the Hackaday crowd, the most interesting bit will probably be the Nikola Tesla Museum. You might know of Nikola Tesla from a webcomic, but he’s actually the greatest inventor of all time, even more so than Elon Musk. Tesla invented radio, even though Marconi got the credit. Tesla invented radar and discovered x-rays. The only person they could find to portray a figure like Tesla in The Prestige was David Bowie. Nikola Tesla is the most iconic inventor to ever live (change my mind), and his museum is in Belgrade.